The blast took place when Afghan security forces tried to dispose of a container full of explosives found in the southern city of Kandahar. Kabul: At least 16 people were killed Tuesday when Afghan security forces tried to dispose of a container full of explosives found in the southern city of Kandahar, officials said. Daud Ahmadi, spokesman for the provincial governor, said four security forces were among those killed. He said another 38 people, including at least five small children, were wounded in the explosion. Dozens of shops and nearby homes were destroyed or damaged, and the death toll could rise, he said. Abdul Saleh, 29, who was wounded in the attack, said the sound was "so loud, like strong thunder." He said he was knocked unconscious and later woke up in a hospital bed. The explosives were found in a cluster of car mechanic shops. It was unclear who placed them there. 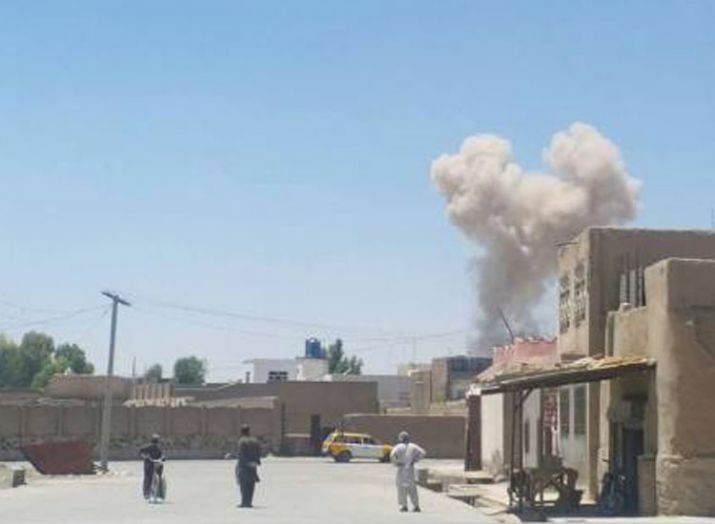 Elsewhere in Afghanistan, the Taliban launched a wave of attacks late Monday in the eastern Ghazni province, killing at least 14 police, including a district police chief and a reserve unit's commander, according to provincial council member Hassan Reza Yusoufi. The attacks continued on Tuesday in four districts, according to Arif Noori, spokesman for the provincial governor, who said 12 other security forces were wounded. Latifa Akbari, the head of the provincial council in Ghazni, said Taliban fighters stormed several checkpoints in the Dih Yak and Jaghatu districts, where all the fatalities occurred. The Taliban claimed to have captured the Jaghatu district headquarters and several police checkpoints in Dih Yak. The Taliban also attacked a checkpoint in the eastern Paktia province, killing at least two police, according to Gen. Gul Agha Rohani, the provincial police chief. Three other police were wounded in the attack Monday night, he said. The Taliban have stepped up attacks across the country since announcing their annual spring offensive last month. An Islamic State affiliate has also carried out a number of large bombings in recent months, mainly targeting the country's Shiite minority.